CNG: Printed Auction CNG 75. INDIA, Kushan Empire. "Samudra". Usurper, circa AD 350-375. AV Dinar (7.58 g, 12h). Sale: CNG 75, Lot: 712. Estimate $500. INDIA, Kushan Empire. "Samudra". Usurper, circa AD 350-375. AV Dinar (7.58 g, 12h). Samudra, nimbate, diademed, and crowned, standing left, sacrificing over altar and holding standard; filleted trident to left, Brahmi "Pu" to left, "Samudra" to inner right, "Gadakhara" to outer right / Ardoxsho, nimbate, seated facing, holding filleted investiture garland and cornucopia. MK 611 (unlisted dies); Donum Burns 813 ("Maiores domus"). Good VF. This "usurper" is unknown apart from his coins. Based on stylistic incongruities with traditional Kushan numismatic iconography (cf. 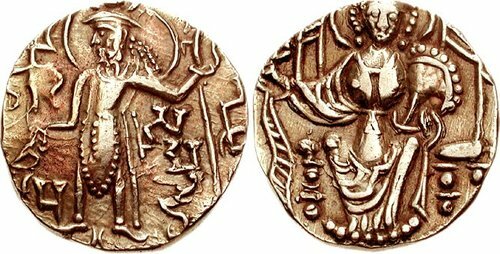 MK 599), the use of ad hoc mints, rather than the usual sites employed by others, and the use of "Samudra", Göbl argued for a field commander striking on behalf of Samudragupta in a region which had not yet been incorporated into the Gupta realm, but where Kushan dinars would have been the accepted currency.